Heard about a fly fishing tournament out of The Back Country Fly shop in Vero, so I decided to pay the fifty bucks and have a go at it. Invited a friend to fish with me. So we got to the spot for lines in a 7:00 AM. Fished at the first spot way too long, about forty mins with no action, so I moved over to the spots I regularly see big fish, but have never thrown a fly to. We worked the Seawalls & docks really hard with poppers & clousers. Pulled up on one seawall & I hear my buddy say in a calm voice, There he is! I look behind me and his 8 wt is completely bent over with the tip buried in the water. So I clamor to set my ten wt down with out snapping in And lift the trolling motor out of the water because it is making a b-line straight for it. As I do so, I got to look into the eyes of a giant. This thing is way over slot maybe close to thirty five inches. Well this thing took one look at me & headed out to sea. Of course it took the route completely under the boat & engine..! As it headed for Mexico, it took about fifty yards of line out before we got the Dear John letter. Yes ... It spit the hook! Now I don't get upset, because really there is nothing you can do when the winning fish was on your line and now it isint, It is the anxiety that I feel for the rest of the day imagining what it would have been like netting it & posing for a picture & telling stories of what it was like. ahhhhhh! Well we worked the area for another hour sight casted to a number of fish with no bites. So we move down to another area, This time I cast my clouser toward a dock & it gets picked up! As it rips the line out of my hand, the anxiety kicks in cuz all I can think about is the fish getting off before we net it. After a nail biting fight, it turns out to be a decent sized trout. This time it gets in the net and we are on the board! 21 incher on the red/white clouser. After fishing here for another thirty min. I decide to move back to the scene of the last crime & couldn't find any more takers, so we moved on to another area. Blind casting like crazy into the docks I hear the familiar sound of There he is, again I look behind me & again his rod is doubled over except this time what I see is worse than I saw before. His fly line is directly peeling out in between two pilings!!!! Then the line takes a u turn and goes in between two more pilings!!!! Yep, after scrambling around trying to reverse the mayhem, it snapped us off!l By this time the wind had picked up out of the South bad, we worked the area for a while & decided to head up to the power plant in the Indian River. We put the boat in at blind creek & headed over to little mud creek to get out of the wind. We got one snook about 12 inches then five more.. They didn't count because the fish have to be 18 inches to count. Ended up catching a few jacks, saw some reds but couldn't get them to eat. By this time it was 3 PM lines out. 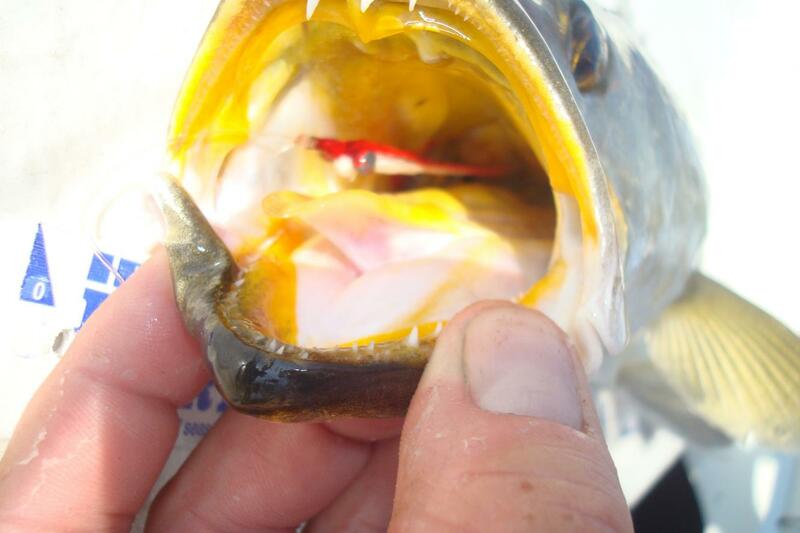 It was a slam tournament, you have to catch a red, snook, & trout over 18 inches to win. We didn't win but we gave it a go.. 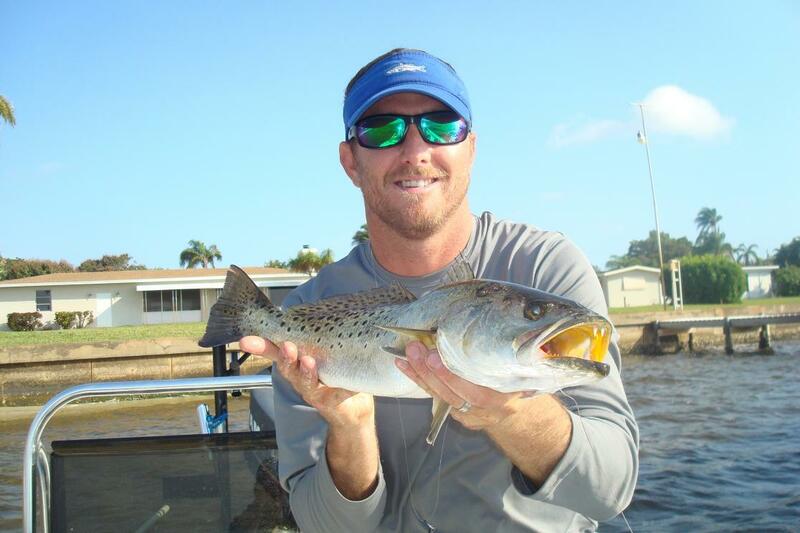 Fishing Guide, Boat/RV Sales & Consulting. Nice... That's a killer trout! Thanks, he fought nice too! Better to hook and loose, than never hook at all. Nice Trout. What fly did the big fish eat? They both ate a big red/white clouser 3/0 four inches long. It had some flash in it.